Join us for a Peace Talk at the PDF Center for Peace and Justice with Prison Radio, bringing the voices of men, women and kids into the public debate and dialogue on crime and punishment. There will be a special screening of the one-hour film, Mumia: Long Distance Revolutionary, which is under Oscar consideration and will be broadcast later this year on STARZ. 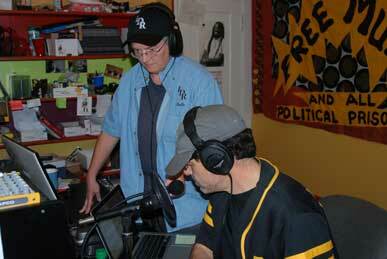 Noelle Hanrahan from Prison Radio will join us to talk about the film and U.S. political imprisonment. Light refreshments and great conversations with activists from PDF-funded organizations. This event is free and open to the public. Click here to register. Noelle Hanrahan, P.I. is an investigative journalist, private investigator, and Director of Prison Radio, a project of the Redwood Justice Fund. She is the producer of the theatrically released feature documentary “Long Distance Revolutionary: A Journey with Mumia Abu-Jamal.” She spent her formative radio years at KPFA Radio, in Berkeley, Calif. An editor and producer of many Mumia Abu-Jamal projects, including All Things Censored (Seven Stories Press. Noelle attended Stanford University and graduated with a B.A. in Gender, Race, and Class Studies, and received an M.A. in Criminal Justice from Boston University.